Gaza will be unliveable by 2020 according to the UN, with daily life already a struggle to find food and shelter, but Dateline finds the people bringing innovation and inspiration to the fight for survival. With my eyes closed, I can hear the crash of waves and feel the wet sand and warm sunshine so familiar from beaches at home in Australia. But when I open my eyes, reality snaps sharply into focus: this is Gaza. The sand is strewn with dense layers of rubbish, nearby buildings have bullet and rocket holes and the breakwall framing this harbourside sunset is a messy mass of rubble – repurposed remnants of three wars in six years. The water may look inviting at first glance, but Gaza’s untreated sewage is pumped into it and the beach is strewn with rubbish. A group of young Gazans giggles on the beach nearby, posing for a selfie stick held together with masking tape. “As-salamu ‘alaykum!” they wave, meaning “peace be on you”, before quickly warning me not to wade any deeper: the city’s sewage is pumped – untreated – straight into the Mediterranean Sea. But the conditions don’t put off determined surfers. The Gaza Surf Club was founded in 2008. “Welcome to the best worst place in the world!” one prominent local grins, telling me resilience is what sets Gaza apart from other wartorn nations, not the adversity of a decade-long blockade, controlling who and what is allowed to enter and leave. This is the only life Sari Ibrahem has known. He describes the home he loves as “a big prison” from which he has never been able to escape, even momentarily. “It’s our culture to be positive!” he enthuses. Sari Ibrahem, also known as rapper MC Sari, says he was paralysed after being shot three times by Israeli soldiers. Known best by his stage name, MC Sari, he raps about life as a young Palestinian. “Ten years ago I got three bullets – my chest, my back, my stomach,” Sari tells me. But his first songs weren’t about his misfortune of becoming collateral damage or the pain and anger of adapting to his new life in a wheelchair. They were about his first true love. “There’s always a girl!” I laugh. “Love is life, right?” he smirks. Despite being surrounded by ruined buildings, children still play. “They don’t have much, but they’re making the most of what they do have,” Brett says. 1.95 million people are crammed into this 360 square kilometre sliver of land. It is one of the most densely populated places on the planet, also home to the world’s highest unemployment rate. 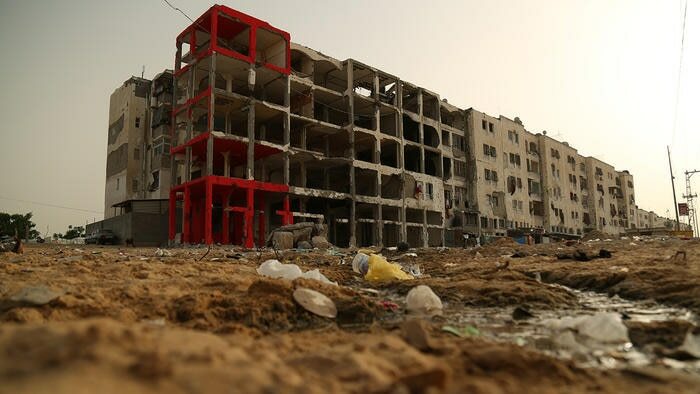 Despite the hundreds of millions of dollars that have been spent here, the United Nations warns Gaza is in freefall – an unsustainable, spiralling state of “de-development”. It’s feared the city’s aquifers will ultimately be irreparably damaged by pollution and a staggering 900,000 people here rely entirely on food aid to survive. Melinda Young from the United Nations Relief and Works Agency, surrounded by the food aid used by around half the population of Gaza. “I think there’s a strange perversity in Gaza,” the United Nations Relief and Works Agency (UNRWA) boss Melinda Young tells me. Dateline asked the Israeli Government to respond to ‘The Survivor’s Guide to Gaza’. This is the full reply from the Coordination of Government Activities in the Territories (COGAT). The situation has become so grave the United Nations believes that “without any economic or effective political outlet”, Gaza will become “unliveable” by 2020. Resilience and determination alone will not be enough to save it. “To think that in a few years Gaza will actually no longer be a viable place for humans to live with any kind of dignity, it’s actually quite heart-wrenching,” Melinda tells me. Explainer: How does Gaza feed itself? Its most fertile farmland is lost in a no-man’s-land, its fishermen can’t work freely and its imported food is blockaded, so how does Gaza feed itself? Even in a place where the locals talk of time in wars not years – “my house was destroyed two wars ago”, “I haven’t worked for three wars” – this is a reality no one I’ve met here is willing to accept. “Palestinian people are ambitious and they take risks,” third generation farmer Iyad Al-Attar explains. Concrete barriers at the edge of the no-man’s-land on the border. The paddocks behind are now too dangerous to farm. His family’s prized paddocks were bulldozed in 2009, his land now sits barren. Swallowed up as part of the deadly no-go ‘buffer zone’ wedged hard against the border with Israel. Gaza’s most fertile land is also the most dangerous, monitored by automatic machine gun towers that detect movement and shoot without warning. Like so many here, Iyad has had to adapt to feed his family. Iyad and his team grow around 2,000 lettuces in the water. He spent three years building an impressive fish farm in his backyard, cleverly developing a system of pumps to recycle the nutrient-rich tank water to grow bountiful soil-less crops of lettuce and other fruit and vegetables. The hydroponic business grew, but the large greenhouse roof protecting the crops below made the family’s home a target. His elaborate set-up was demolished – twice – by drone strikes in the 2012 and 2014 wars. Ahmad Abd Alhadi is another farmer without any farmland – he’s turned part of his house into a factory growing mushrooms using these bags. But with the help of his sons, Iyad has rebuilt. And he knows that with tensions rising, he probably will again. “There is no alternative”, he tells me. “If people stopped working, they will die from hunger… despite all the destruction and our hard lives, we are still alive after all”. Brett also visits the Gaza Sky Geeks office, which is home to 16 hardware and software developers. Their innovations include a charger to tackle the power shortages. As my producer and I make the long, two-kilometre walk through the imposing caged no-man’s-land linking Gaza to the outside world, Hamas fires rockets at Israeli military positions. The IDF retaliates with a series of air strikes on Hamas strongholds, detecting and destroying a series of tunnels along the border. This street scene shows the damage to buildings in Gaza. Many others are riddled with bullet holes. A street mural with the words ‘Gaza Love Life’. A giant, colourful mural booms ‘Gaza Love Life’ – but according to the United Nations, this is a city – and a culture – fighting for survival. And it’s a battle they don’t appear to be winning. See the full story at the top of the page, and read the Israeli authorities’ response in full.